There have been echoes from local media that Hollywood was making another King Kong feature film in the agrarian outcrop of Tam Coc. If you need a reason to escape Hanoi for the weekend, then having the new home of King Kong only two hours away by motorbike is more than enough for most. Fill the tank up and you have all you need to make the 105km journey and then some. All you need for the overnighter is a small back pack and around US$40 between you and your companion for food, drinks and a wonderful trip through the gorges and limestone caves. Hanoi, in all its crazy glory, can make you crave some fresh air and luscious landscapes. Follow Giai Phong Road out of Hanoi and at this point the road will become Ngọc Hồi Road. 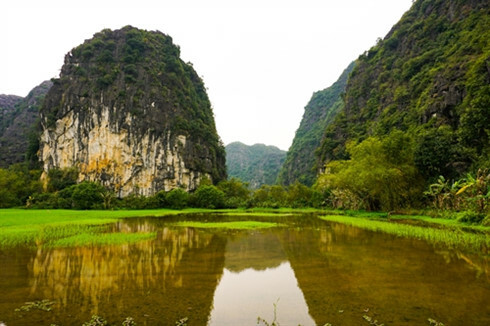 The railroad will guide you all the way to the main town of Ninh Binh, where there’s a right turn to Tam Cốc. The beauty of this region unfolds a little more after every ten kilometres. Once you are truly clear of Ha Noi, the awe-inspiring structures begin to appear in the distance. It is only once you reach the first large bridge that you begin to see the ancient monoliths and waterways carved out of the landscape. Don’t trouble yourself over the weather; with or without the sun, the shades of green are still just as numerous. For US$7, each of us had a dormitory bed to ourselves at a homestay with breakfast included. On arrival I felt like I was on the set of Jurassic Park and not King Kong, but you can see why Hollywood used this pristine landscape. The homestay is located in a village named Ninh Thăng. It is situated only a kilometre or more from the entrance to the main attraction. When you take your bike up the main road you arrive at what could be mistaken as a Vietnamese-Venetian canal, but the palm trees and jungle-covered mountains make this very much a one-of-a-kind place. From here you can take a boat and float along, but we chose to walk for a few kilometres and began our journey through the caves near the old temple. As you walk along you can see human nature in perfect harmony with nature itself. The human eye is able to see the colour green better than all others and this is the perfect place to see that. The internet is filled with pictures of this wonderful place but you need to see it through your own lens. From underneath the shadow of each of these mega-structures, you can see people living far away from the digital world. There is no noise other than the sound of the wind cascading through the steep valleys. There are families living deep inside these waterways and you can catch a view of life from an ancient era. The beauty of the hard working men and women, perpetually at work will remind you of who you are and why you’re there.